The Vice President, Yemi Osinbajo, has launched the FCT TraderMoni programme, a collateral and interest-free loan scheme initiated by the Federal Government to assist petty traders across the country. According to Osinbajo, the scheme is aimed at spreading prosperity and reducing poverty, especially for petty traders in respective of their socio-political background. 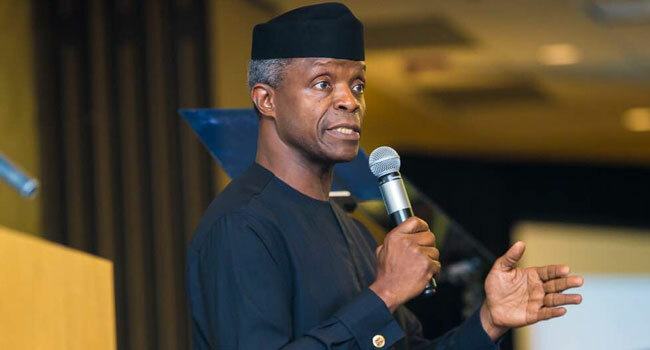 In a statement by the Vice President’s spokesman, Laolu Akande, Osinbajo said that the programme is part of the Social Investment Programme of the Buhari administration. He explained that it has been launched in Lagos, Kano, Katsina, Abia, Osun states and would be extended, in quick succession, to traders in all the states of the federation by the end of 2018. Speaking to traders at the Utako market shortly after witnessing the disbursement of funds to beneficiaries, the Vice President said every petty trader was eligible to benefit from the scheme and urged petty traders across the country to take advantage of the scheme to improve their businesses. “This programme is for the petty traders selling in the markets, it is not for bigger traders. It is for the petty traders to improve their businesses. “For now, we are giving you N10, 000, if you pay back in six months or less, you will get another N15, 000. We want to encourage petty traders so that they can have sufficient amount to improve their businesses”, he stated. He assured beneficiaries that the amount given to them would be increased if they paid back their loans within the stipulated period, adding that President Muhammadu Buhari himself was interested in the welfare of the traders. “The one we did before was for big traders under the GEEP programme, we gave them as much as N100, 000. If you do well with this one we are giving you now, we will increase the amount. “Everybody can benefit from this scheme, the President himself has said that he wants to make sure that those who are selling small items in the markets benefit from this programme. “When we give you this money, we want you to pay back and no interest is involved”, he added. Earlier on arrival at the market, Prof. Osinbajo went round interacting with petty traders before he proceeded to address traders who had thronged access roads around the market to receive him. He was accompanied to the programme by two Ministers of State: Industry Trade and Investment, Hajiya Aisha Abubakar and Zainab Ahmed among other top government officials.